Create a project with composer. Clone the GitHub repository and install dependencies. These methods are detailed below. Make sure you are using PHP 7.1.26 or higher and have Composer installed. If you do not, use Composer installation process described in the official documentation. Obtain the Oro application source files using the git clone command. Replace the <version> with the version to download. Along with the released versions (like 3.1.2), you can use the master branch to run the latest development version of the Oro application. In [$oro_installation_folder] parameter, specify the directory to clone the application source files into. Replace the <repository_URL> with the GitHub URL of the repository to clone, e.g., https://github.com/oroinc/crm-application.git. Note that you are prompted to enter the installation environment configuration and that are saved into the config/parameters.yml file. A description for every parameter you can find in the Infrastructure-related Oro Application Configuration article. 1. 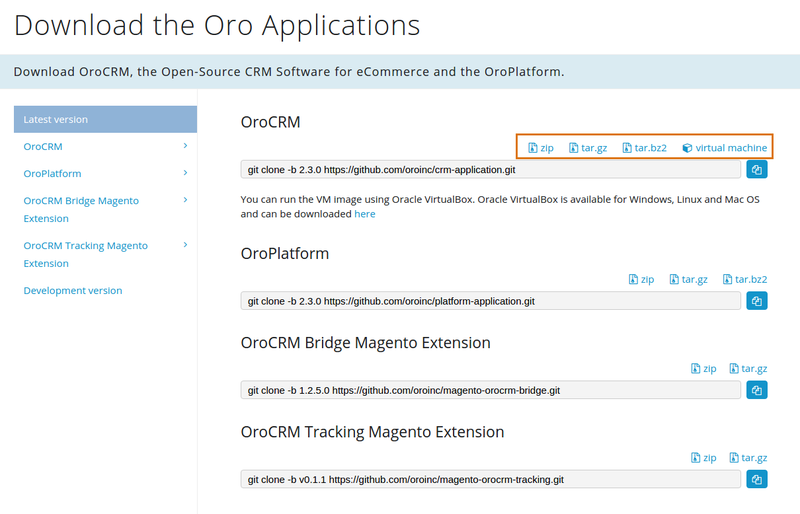 Download the latest version of the application source code from the download section on oroinc.com/oroplatform. Click the zip, tar.gz, or tar.bz2 link to download the archive. You can also download the virtual machine to quickly deploy the application in the virtual sandbox environment. All required dependencies already installed in the vendor folder in the extracted archive. Unlike when cloning from the GitHub repository, you are not prompted to enter the configuration parameter values. Default values are used instead. If necessary, update configuration parameters in the config/parameters.yml file after the command execution is complete.